It is my good fortune to write the final travel log of this amazing ride on the bus – three weeks, 12 states and 21 cities. We left Stella Maris Convent early this morning where we had received such kindness and hospitality from the Sisters of St. Joseph of Chestnut Hill. We drove to St. Joseph Preparatory School for our final event: a closing rally and blessing. Father Phil Florio, SJ welcomed us and offered the opening prayer. Our speakers included Mary from POWER, a faith organizing group; Emily from Witnesses to Hunger; Gloria from the New Sanctuary Movement and Terrell a health insurance navigator with Health Federation of Philadelphia. Their reflections were inspiring as well as their lives and their commitment to do their part for the common good. 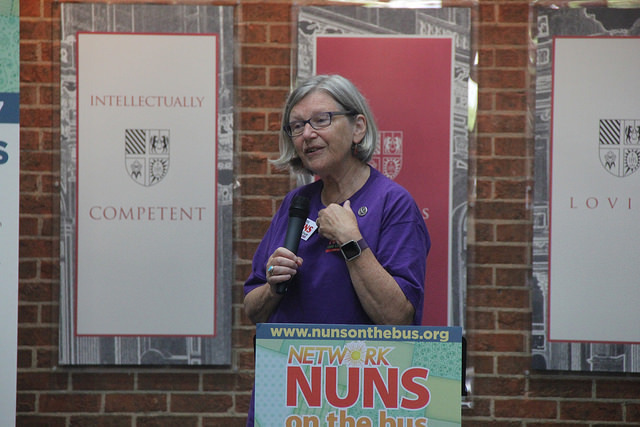 Sister Simone addressed the group, thanking them for their works of justice and all the efforts they put into organizing this final event. She then put together a “walk through” the tour, where Simone mentioned a number of people she had met along the way and how their stories had touched her and the other Nuns on the Bus. It was quite moving to hear the stories back-to-back like that. Together we had a final blessing for the bus, for one another and in Thanksgiving to God for the mighty works we had seen. After the rally, we sisters said our goodbyes as various ones of us were taken to the airport and Amtrak. My response to all that has been is gratitude. Gratitude to Sr. Simone and the Network Staff for their vision, creativity and weeks of preparation as well as the incredible amount of coordination that happened each day; gratitude to the communities of Women Religious who were so supportive, to the staff and clientele in the many ministries we visited who shared their stories and to the hundreds of people who came to the caucuses and rallies and blessed us with their concerns and insights. I climbed to the topmost row and carefully made my way to the seat that a young man graciously gave up for me. 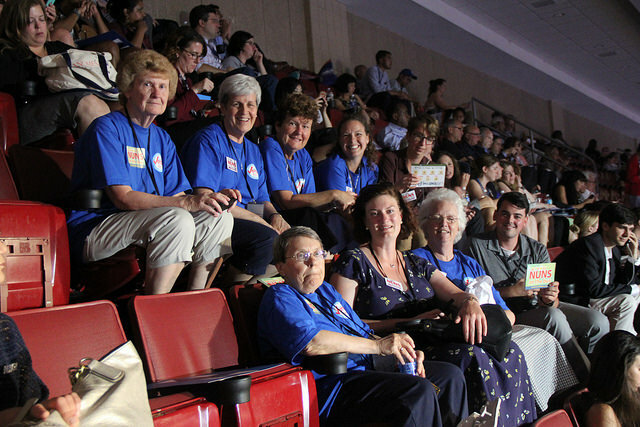 It was the last night of Nuns on the Bus and we were able to get some passes to the Democratic National Convention. 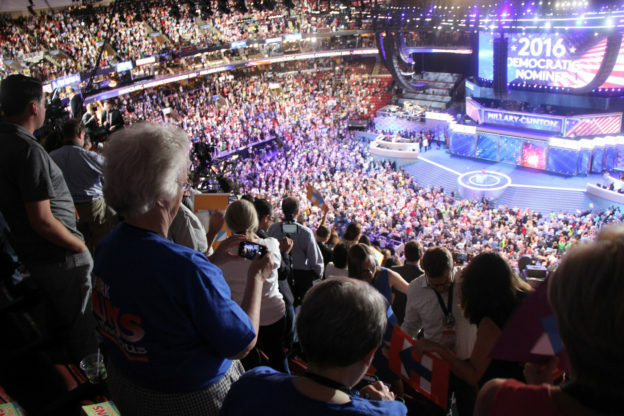 I had been there two nights before to see the first woman nominated by a major political party for President of the United States and I was now about to witness Hillary Clinton accept the nomination. It had been a dizzying schedule and just making our way into the arena to find seats was a challenge. 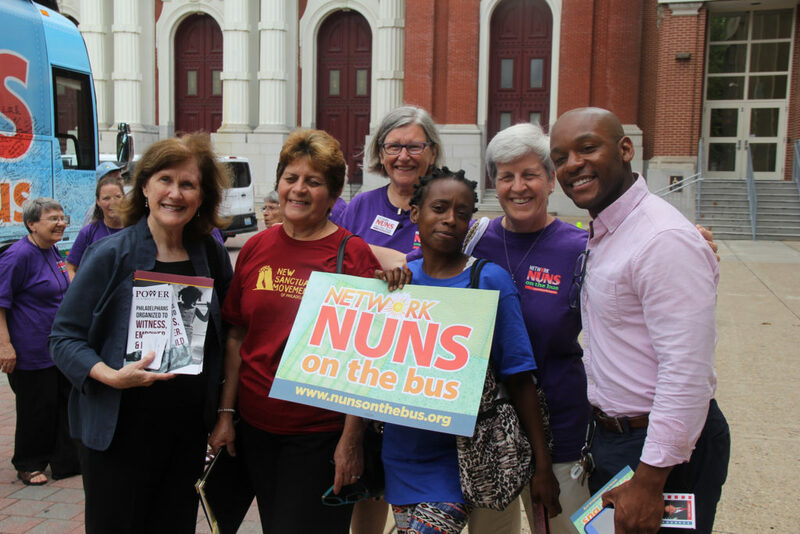 I was settling in, talking with a few young women around me about Nuns on the Bus and our current trip when one of them said a friend of hers would like to meet me. Of course, I said! 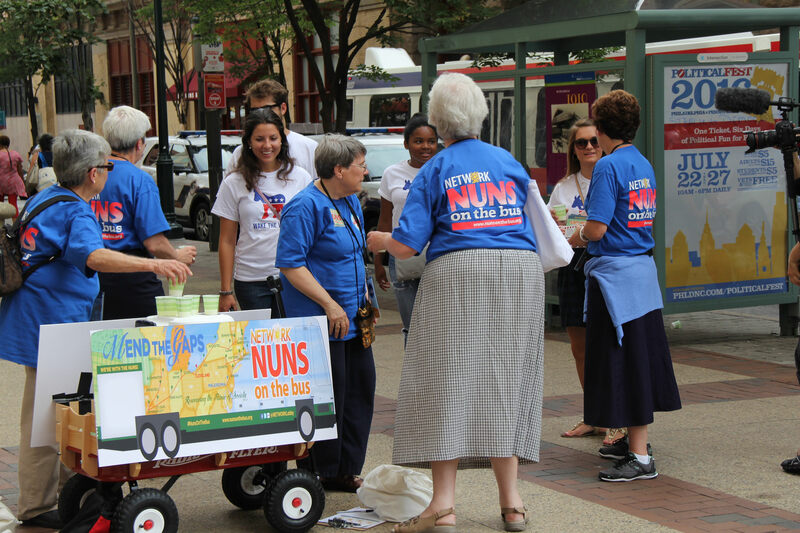 Nuns on the Bus never pass up an opportunity to get out the message. And yet, here I was, more than five decades later, about to witness something we had never imagined happening become a real possibility. It’s about time, I thought! And I had to wonder why it had taken so long. It has been quite a journey; the pathways paved by so many. Joyce Johnson Rouse’s song “Standing on the shoulders of the ones who came before us” echoes in my mind and heart. I am so grateful for their courage and tenacity. My maternal grandmother emigrated from Poland in 1912 when she was sixteen and worked in a meat packing plant in St. Joseph, Missouri. Widowed at an early age with six young children, she remarried and moved to northwest Kansas to farm. I have no idea what her life was like in Poland or how much education she had. Or her challenges of being an immigrant. My mother was born in 1919, one year before women gained the right to vote. She did not finish high school, for economic reasons. Dreams deferred or never even formed? Possibly. Even if that were so, I am standing on their shoulders and am the beneficiary of their struggles and sacrifices. What an incredible blessing to have lived during these last decades and all that has evolved! Alive through the awakening of our consciousness as women, claiming our own gifts and our ways of knowing and doing things. I remember it was even a struggle to try to overcome sexist language both in society and in the church. I read “Beyond God the Father” by Mary Daly, launching my ever-expanding quest for God. I recall attending many a meeting when I felt invisible and of experiencing that the only way we could move our agenda forward (no matter how noble) was to get a man in a position of influence to believe it was his idea. Feeling increasingly disoriented and out of it, it was so liberating to discover the underlying cause: We were living within a dominant male paradigm which denied our experiences as women. We had to work harder than men to be taken seriously and get a seat at the table. We grew to honor our own skills and who we were as women. We learned from each other, bonded together and gave each other a hand. We became sisters of the struggle. I also stand on the shoulders of the women religious who have gone before us, especially those who dedicated their lives to educating girls and women, who established the Catholic health care system and were pioneers in social service. I’m grateful for those who continue to empower girls and women around the globe, evident in so many stories we’ve published for Global Sisters Report. Little-by-little, one-by-one opportunities have opened up, most of them hard fought. The younger generations have many more opportunities and have taken the lead in ways I could not have imagined. But they also have their own struggles to have a voice, to contribute, to be agents of change. There was a special kind of excitement among the women and girls in the crowd on Thursday night. We all cheered when other path-makers appeared on the stage or the screen. There was an unspoken knowing among us, sisters of the struggle. The work is not finished. The stories we Nuns on the Bus heard along the way attest to that. Women and children are bearing the burden of our current policies. We need a living wage, family friendly workplace policies, access to healthcare and tax justice to support our communities and our families. We need greater access to voting and citizenship for a healthy democracy. We need to continue the struggle for full participation of women in the church. Yes, there are gaps to mend and still much to be done for and by women all over the world. But on that night, it was time to celebrate and witness together history in the making. Today marks the last day of the convention. Hard to believe these days are drawing to a close. “Old St. Joseph Church” in central Philly was the site for a liturgy that we attended Thursday morning. The church prides itself on being the oldest Catholic Church in Philly. Jesuits began celebrating liturgy there in the 1700’s when religious liberty was still a dream for many of the original thirteen colonies. Father Phil, the pastor spoke of the parish as always being a place where religious liberty and all are protected, encouraging those present to be earthen vessels, shaped by God to serve one another. The liturgy drew on the best of our Catholic tradition. We were invited to pray for our nation, for world peace, for justice and fairness. (No candidate’s names were mentioned!) 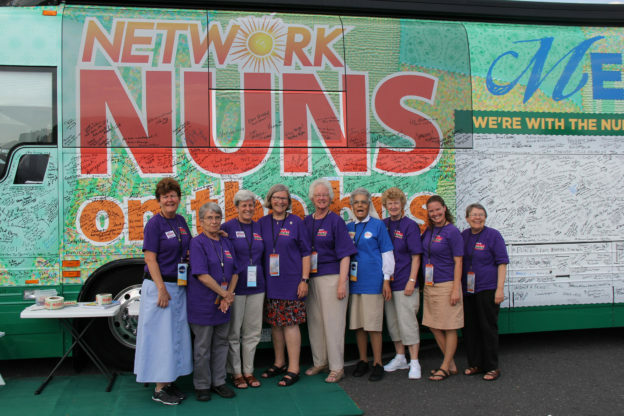 Once again, we were surprised at the name recognition for Nuns on the Bus. 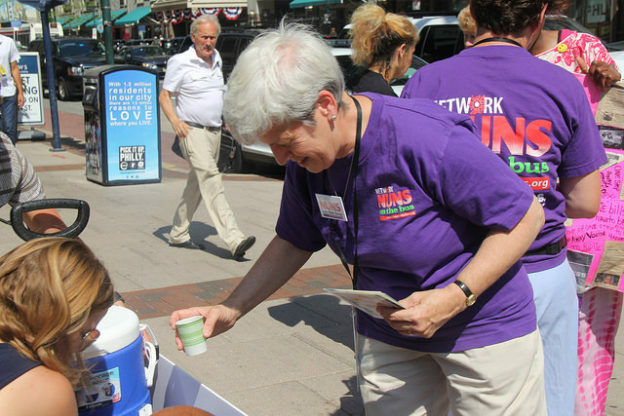 We continued our “lemonade ministry,” often surprising passers-by with an offer of free lemonade and leading to some great conversations about hopes and fears for this election cycle. 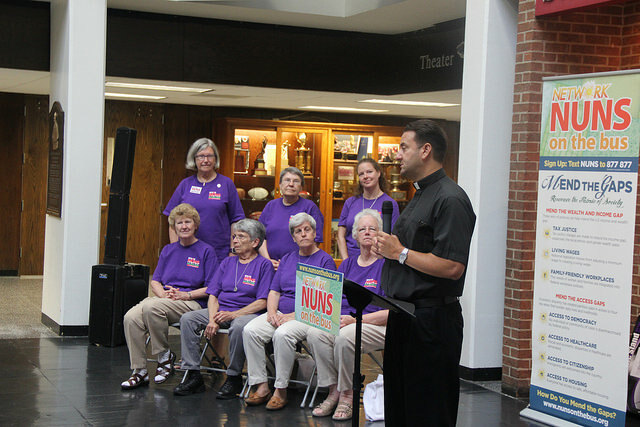 Our afternoon workshop drew a really diverse group of participants – including many local nuns, “Mrs. Georgia,” (complete with a tiara) and her four daughters, a few local health center employees who were on their lunch break and lobbyists for the teachers union. One component of our workshop is a “Human Bar Graph,” where we sisters pace off the steps that represent the wealth of each quintile of our population. 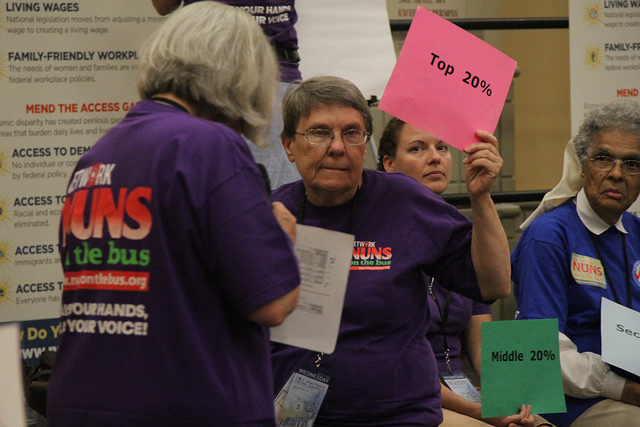 The nun representing the top 20% got to take twelve steps forward to represent the 60% that their incomes have grown over the past forty years. However, since I represented the bottom 20% I have to take two steps backward to represent that this group’s income has actually decreased almost 10% in the past forty years. When we broke it down further to the top 5% and then the top 1% the figures were staggering. Then it was off to the Wells Fargo Arena; security was high and seats were quickly filled by 5pm. I met Congressman Joe Crowley and his son Sean as I waited on the food line! We listened to Governor Andrew Cuomo, were moved by the delegation of women Senators, were stirred by the words of Rev. Barber, and were entertained by Carole King and Katie Perry, among others on the night’s line up. The crowd was pumped by the time Chelsea Clinton made her way to the podium speaking lovingly about her upbringing by her mother Hillary and the example of her grandmother, Dorothy Rodham. After a video of Hillary’s life, Hillary entered from a center stage. 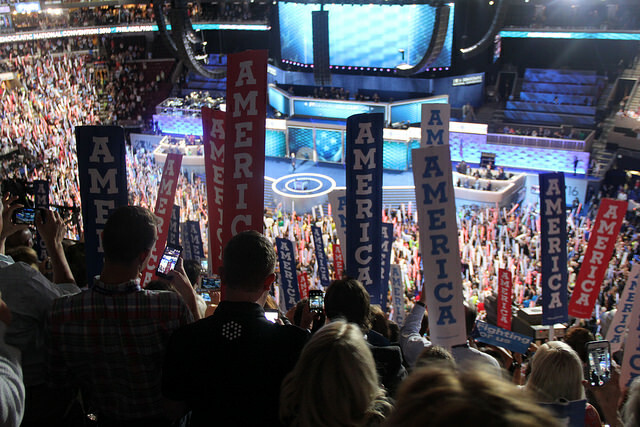 The moment had come to accept the Democratic party’s nomination of her as their candidate for this year’s presidential election. It was wonderful to be in the arena for this historic moment, as balloons and confetti showered us and fireworks were set off from both sides of the stage. It almost felt surreal to be there! Although very tired after these long days, it was hard to settle into sleep after such an exhilarating night – but we did! These have been unbelievable days as a Nun on the Bus and will long be savored. We feel blessed to have journeyed with some incredible religious women who are incredible witnesses to the gospel message of Jesus. And we were buoyed by the hardworking men and women we met in all the cities and eight states we travelled – people who still believe and have hope for the future of our country and want to be active participants in defining its future. These days will be long remembered!